In this video we will discuss, generating hyperlinks using actionlink html helper, for navigation between MVC pages. Please watch Part 8, before proceeding. We want to display all the employees in a bulletted list as shown below. Notice that all the employee names are rendered as hyperlinks. 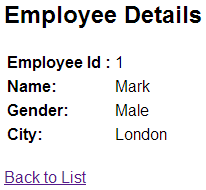 When the hyperlink is clicked, the user will be redirected to employee details page, displaying the full details of the employee as shown below. Copy and paste the following Index() action method in EmployeeController class. This method retrieves the list of employees, which is then passed on to the view for rendering. At this point, "Index.cshtml" view should be generated. Copy and paste the following code in "Index.cshtml". hello Venkat, Hope you are doing good. I have a question in this session. How can we achieve "@model IEnumerable" in MVC2 using aspx page. Can you please explain about 'EmployeeContext ' ? Sir, can you tell me how to get list of employee using "groupby city" for same example. Sir,Without using entity framework,can we inherit DB Context Class in my class.. Please explain me about DB Context Class and Db Sets?? Many thanks for your videos. It is quite useful. I am not a programmer - but these videos help me to shift my career to programmer. While following this video I am getting cannot implicitly convert type 'System.collection.Generic.List' to System.Web.MVC.ActionResult. It would be helpful if you can give your inputs - if possible. I using the same entity objects as you are doing. Because it's newer than ADO plus you dont have to write a lot of code in worked with EF and Linq. Sir, thanks for such wonderful video. I can please explain the difference between @Html.ActionLink() and @Html.RouteLink(); And which scinario use one over the another? Whatever fields/properties are there in routeValue object, MVC will try to map it with the action paramters your link will invoke. So here, Details(int id) action expects id as input, so we will pass it in routeValue object. More values can be passed as well but their names has to be same as that of parameters and MVC will do the rest.